The women of Fancy, St Vincent and the Grenadines and WAND’s Dr Judith Soares. The University of the West Indies’ Women and Development Unit’s (WAND), community development project in Fancy, St. Vincent and the Grenadines has received an award for “Women’s Creativity in Rural Life” from the Women’s World Summit Foundation (WWSF). Head of WAND Dr. Judith Soares, said that the Fancy Community Help Group (FCHG) was among the 13 laureates worldwide who received this award and one of the two who received it in the Americas. The others were from Africa, Asia and Oceania and Europe. The women of Fancy were particularly recognised for their “Indigenous Community Banking for All” project in a community which has no local access to commercial banking. WAND’s work in Fancy began in 1997 on the advice of its community consultant in St. Vincent and the Grenadines, Christobel Ashton. She had done work in the community as an adult educator and understood the social dynamics, needs, possibilities and potential of the women of that community. “The women of Fancy have shown and are showing that women can control their own destiny, that women are victors. It is time women stop embracing/glorifying their victim status and take control of their own lives, and by extension, that of their families and their community,” said Soares. WAND initiated, funded and guided the project under its programme of Community Intervention Initiative and continues to use participatory research methodology as a tool to positively impact women’s community development efforts. 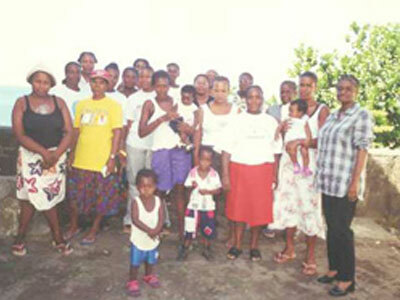 Fancy is a small remote community at the northern most tip of St. Vincent, a community of 240 women and 170 men distributed in 140 households. The remoteness of the community and the socially disadvantaged position of the women forced them to become creative in transforming the lives of their fellow community members. The group started when several small organizations, including churches and sports clubs, came together to form one community organization with initially 22 women members. After examining a series of alternative ventures, they decided that pig rearing presented the least risks and least inputs in terms of capital. When the original piglets reproduced at maturity, they were distributed first to the neediest, then alphabetically. When household food needs were met, pigs started being sold on the external market, thus generating additional income, part of which was invested in social activities in the Fancy community, like installing electricity in the preschool or food hampers for senior citizens. The next stage came with the creation of a revolving loan scheme, which resembles somewhat the Grameen Bank system. The project has enabled the Group to provide emergency assistance to members, facilitate access to medical care, enable members to invest in their children’s education and develop income earning ventures such as farming. Over the years, the FCHG has been involved in a large variety of community outreach projects funded from the collective coffer. Women members have acquired self-confidence and significant leadership skills, and have committed to focus training activities on the poorest members of the community. Now WAND, which is a unit of the School of Continuing Studies, of the lead departments in the new Open Campus of the UWI, is helping to introduce an Information Communication and Technology (ICT) project to extend formal education to Fancy.